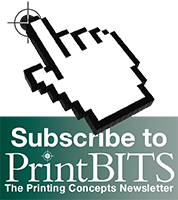 PrintBITS: 6 Myths of Printing - Printing Concepts, Inc.
You know how these things get started: One person hears a rumor, then tells two people, who in turn tell two people, and so on. Print marketing is especially susceptible to the rumor mill. A host of inaccurate myths surrounds the print industry, leaving many with the wrong impression—that print isn’t eco-friendly or effective… and other misconceptions. However, misinformation can lead to missed opportunities and a weaker marketing presence for your brand. Protect yourself from the harmful myths by learning the truth behind the power of print. The paper industry is often unfairly criticized for being harmful to the environment, and the idea of a paper-free workplace has been a frequent topic of conversation over the past few decades. However, paper can be recycled, and it is also a renewable resource. Paper often comes from managed forests or farms, which replant about 4 million trees every day (four times more than they harvest). In 2010, 63.5% of all paper consumed in the US was recycled, and the numbers have been increasing. Paper-based marketing also has a smaller carbon footprint than digital marketing, since carbon emissions are only produced once, during the creation of the product. Meanwhile, carbon emissions occur every time someone uses a digital device. Even the act of producing a CD creates more CO2 emissions than printing a 100-page report in full color. Always use stock made from recycled paper. Encourage recipients to reuse, recycle, or even compost your materials instead of throwing them away. Using organic inks (such as soy ink) is a great way to avoid adding harsh chemicals to your marketing materials. You can skip the ink altogether and use blind embossing or die cutting, which require no ink at all. Many people write off print marketing as old-fashioned and ineffective in a digital marketplace; however, the industry is still thriving and customers are still responding positively. According to an International Communications Research survey, 73% of consumers said they preferred to receive printed mail announcements rather than email announcements from the brands that they like. Meanwhile, another survey commissioned by Two Sides showed that 70% of Americans said they prefer to read things on printed paper over a digital screen, and 67% said they liked the feel of print media over other mediums. Think of it this way: On the Internet, there is an unlimited amount of content to distract the audience from your brand; meanwhile, with direct mail marketing, there is a smaller pool of competition and thus you have a greater chance of connecting with the audience long enough to make a conversion. Print marketing need not be limited to the mail, either; personally handing out your media to a potential customer is a great way to make a positive connection. The most effective marketing strategy is the one that covers all your bases with both printed and digital media. Add QR codes and URLs to your print media to steer the audience toward your website or social media page. According to a study (pdf) conducted in 2007, 67% of online searches are caused by offline communications—which means a strong print presence can actually lead to more online conversions and sales. Your digital marketing and print marketing campaigns should promote the same message and display your brand in the same light, but that doesn’t mean your designs are interchangeable. Many Web designs are not what you would call “print-ready,” and printing them without alteration will result in a misrepresentation of your brand. For example, the colors you use may not print with accuracy. Designs made for the Web are created using a combination of red, green, and blue (RGB) hues, whereas printed materials use cyan, magenta, yellow, and black (CMYK) to reproduce color. The differences can lead to discoloration and make it so your branded design elements don’t exactly match your brand colors. Likewise, you might have a Web-optimized logo that uses multiple colors but you might find yourself in a situation where you can print only using one color. Without designing your Web logo to be print-friendly ahead of time, you’ll either have to completely remake the logo for print or create a separate logo just for your printed materials. You should also remain aware of the resolution of your images. Web designs tend to be lower resolution, with a standard of 72 dpi (dots per inch). If these same images are used for print, they’ll come out hideously blurry and pixelated. Print materials require higher-quality images set to at least 300 dpi. The appeal of digital media is how quickly it can be altered. With a few keystrokes, you can completely personalize your marketing materials with the customer’s name or other information, creating a stronger connection to the audience. However, the same level of customization is available with your print marketing materials with a variety of different techniques. Variable printing is like the print marketing version of the find-and-replace function in a word document. It makes it possible so that the entire design stays the same, but one part of that design changes, such as a customer’s name, a city name, and so on. For print media with more than one page or panel, such as a folder or report cover, you can add a die-cut window for easy personalization. Die-cut windows let you see inside the front cover, so personalization is a simple as changing what’s behind the window. When you personalize with print, it’s more impressive than on the Web; after all, consider the amount of personalized emails you have sitting in your spam box. Your audience knows that sending personalized emails is not difficult, but they’ll be captivated by personalized print media because they’ll believe it was expensive and difficult to have customized, which makes the customer feel more special. Many make the mistake of forgoing creativity in their marketing materials in favor of sticking to the standard features; however, it’s hard to make an impact when your collateral doesn’t stand out. You’re not just restricted to a bland, printed rectangle; depending on the printer you choose, some 15 million combinations of options may be available. For example, custom die-cutting lets you completely alter the shape of your media so you can do things like create business cards that are shaped like your product or add a uniquely shaped pocket to your presentation folder. Changing the shape of your media makes it easier to remember and harder to part with since it looks and feels different from the standard template. In fact, the tactile feel of your marketing materials can help you create a stronger connection to your audience because they’re experiencing your media using more than one sense at a time. That means picking a stock that feels sturdy (not flimsy) and possibly considering a textured stock like vellum, linen, or kraft for added impact. Special coatings such as soft touch or satin can give your media an extra textural component. Keep in mind that just because these are printed marketing materials doesn’t mean you have to use standard color ink as your only imprint method. Embossing is a special method that uses heat and pressure to stamp a design directly into the paper itself, resulting in a raised effect that looks sophisticated and adds a level of texture. Foil stamping and metallic ink can be used to create shiny, reflective areas of your design that grab the audience’s attention. For best results, mix it up by combining imprint methods, such as embossing and foil stamping to create a raised metal effect. One of the worst misconceptions about print marketing is that you can get it from any source and it’ll always be the same. No two printers are ever alike—from the options they offer to the equipment they use for printing. If you use more than one printer for your marketing materials, you might end up with some noticeable variations in your marketing materials, which could lead to brand confusion. The best way to ensure high-quality results across the board is to find a printer you like and stick with that printer for all of your printing needs. You should build a working relationship with your printer; it’s not enough to just send them your order and be done with it. You want a printer who is willing to work with you, not some cookie-cutter online print shop where you can place your entire order without ever communicating with another human being. A good printer can answer any questions you might have about the printing process, as well as offer suggestions on which special options to use or how to improve the look of your materials. Many printers hire in-house designers who can create your media from scratch or help bring your design to a print-ready state if it is not already. You can also save money and time by finding a printer who does it all, so that you’re not getting business cards from one place and folders from another. According to Nielsen Research, nearly 90% of consumers say they want to receive print marketing collateral related to promotions and sales. Like the old saying goes… the customer is always right. A smart marketing plan is all-inclusive, focusing on both printed and digital communications equally to achieve maximum result. That means you can’t afford to get tripped up by false information about the print industry when nearly half of your marketing strategy is at stake. Are there any other rumors about the print industry that you would like to see laid to rest? Do you have unanswered questions about print marketing that have been gnawing on your mind? Leave your comments and inquiries below! World class technology, old-fashioned service. Complete our Contact Form, call or stop by to talk to us. Let’s Make A Splash in 2014!